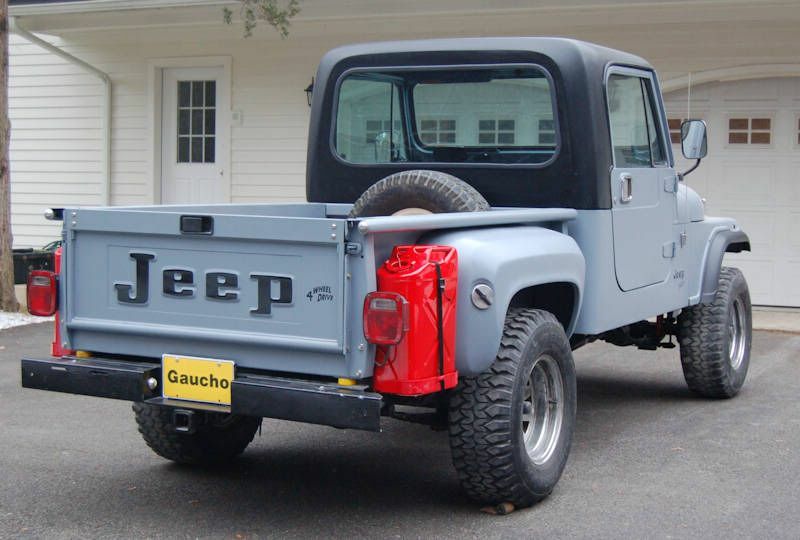 After finishing the Retro Wrangler, my next project was a CJ pickup, with styling based on the "Gaucho" pickup that was a custom offering by a Jeep dealer in the late 70's. 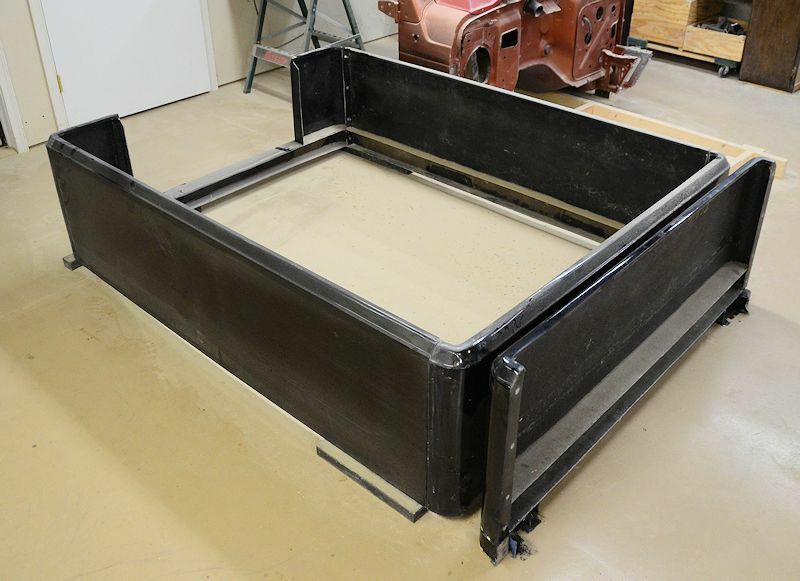 Building that trailer involved a significant amount of fabrication work, and I kept thinking there had to be a better way for the average DIY-er to build a trailer to match his Jeep, so I ended up designing and building a fiberglass Jeep-tub trailer kit. 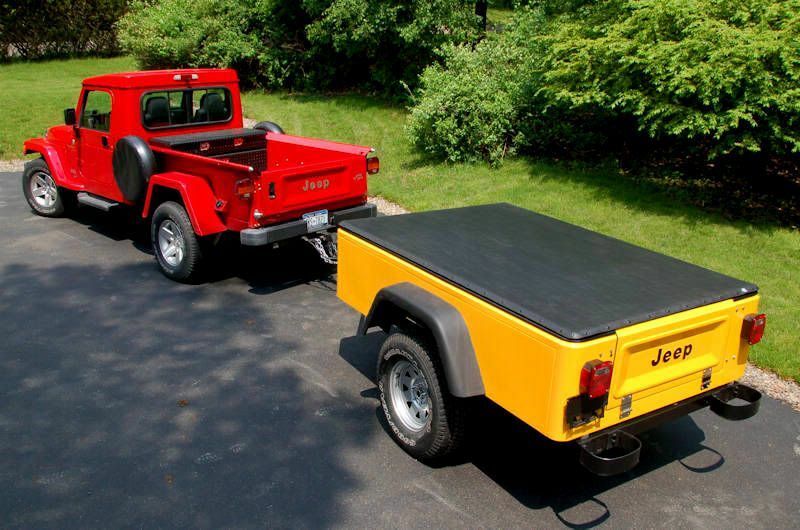 The fiberglass Jeep-tub trailer was licensed by a company and is now sold under the Dinoot name (http://www.dinoot.com). 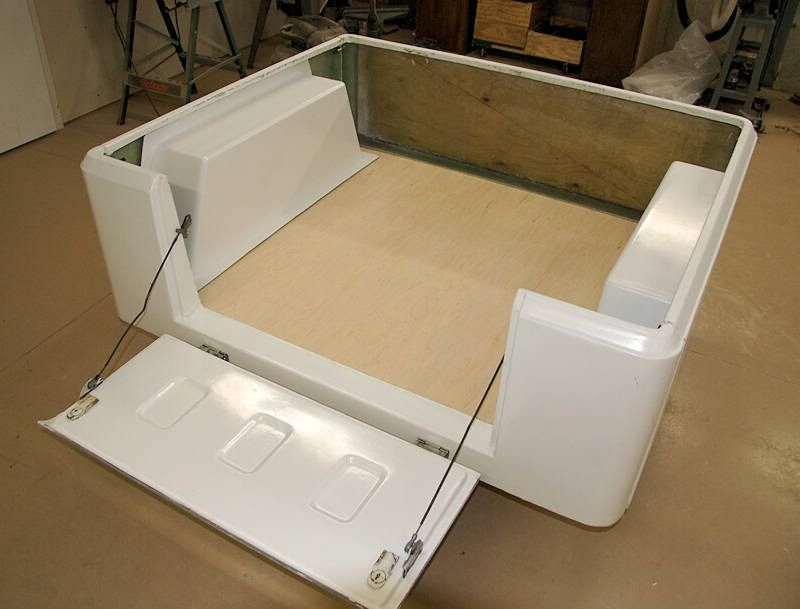 As part of the design project for the trailer tub kit, I also planned that the tub kit could be used as a pickup bed, and the tub end panel could be used as the back wall of a Jeep tub cut to pickup cab length. In this thread I'll be showing how the Dinoot parts work for a Wrangler pickup bed and also for the rear wall of the cab. 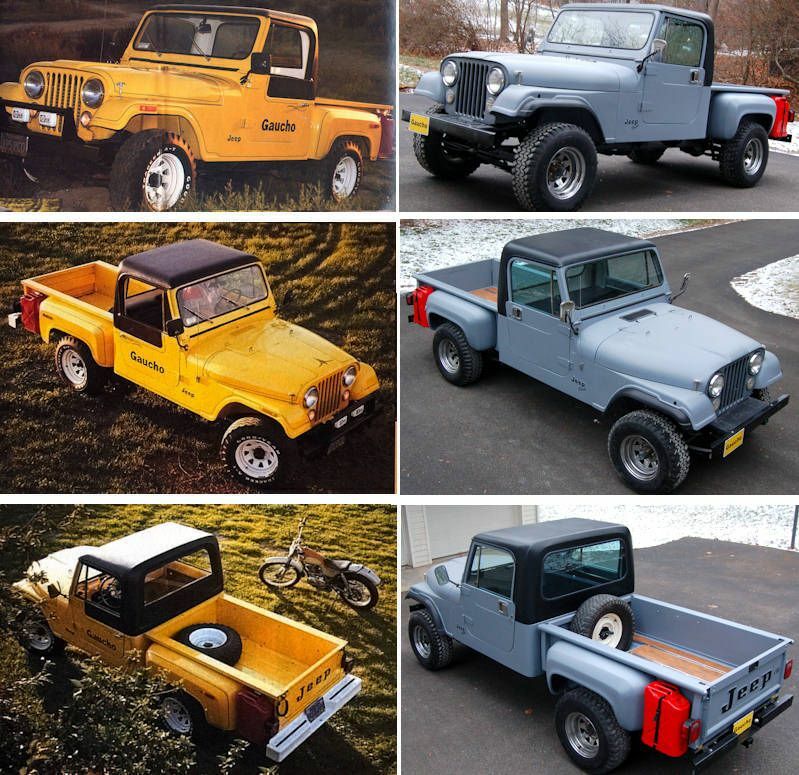 And since the key dimensions for the tub conversion to a pickup tub are the same across the TJ, YJ and CJ-7 Jeeps, with just some detail differences the modifications I'll describe in this thread can be applied to any of the three models of Jeep. I've done a bunch of pickup concept drawings over the past couple of years using the Dinoot parts, here are two. 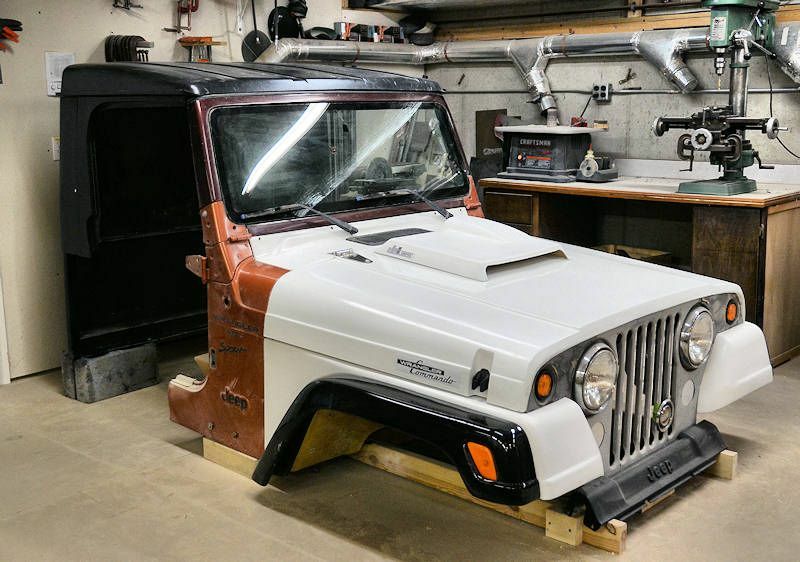 One concept I named the Rustler, it starts with a TJ, uses a 6'6" Dinoot Extended trailer tub kit as the bed, a Dinoot trailer tub end panel for the back of the cab, and a CJ front end conversion kit (another of my fiberglass projects). Of course you could build one with a stock TJ front end too . Love it! Been thinking along the same lines. 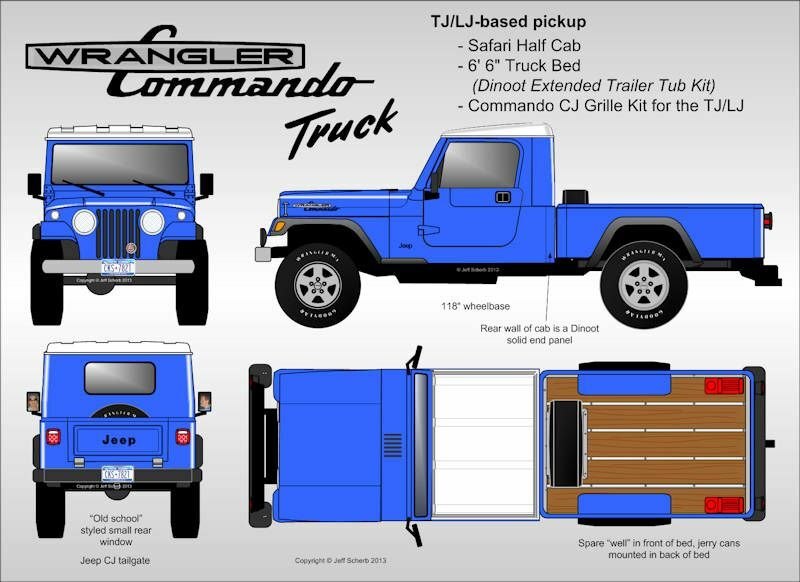 If you get time, would enjoy seeing a sketch of what I'm thinking; TJ tub, Safari half cab, the CJ2 fender/grill setup, 5' bed with round tube rack that places a roof top tent an inch or two above the roof line. Thanks! 1966 Stevens M416 "Now she is gone I got my Yukon"
(08-25-2014, 03:13 PM) Scott Wrote: Love it! Been thinking along the same lines. 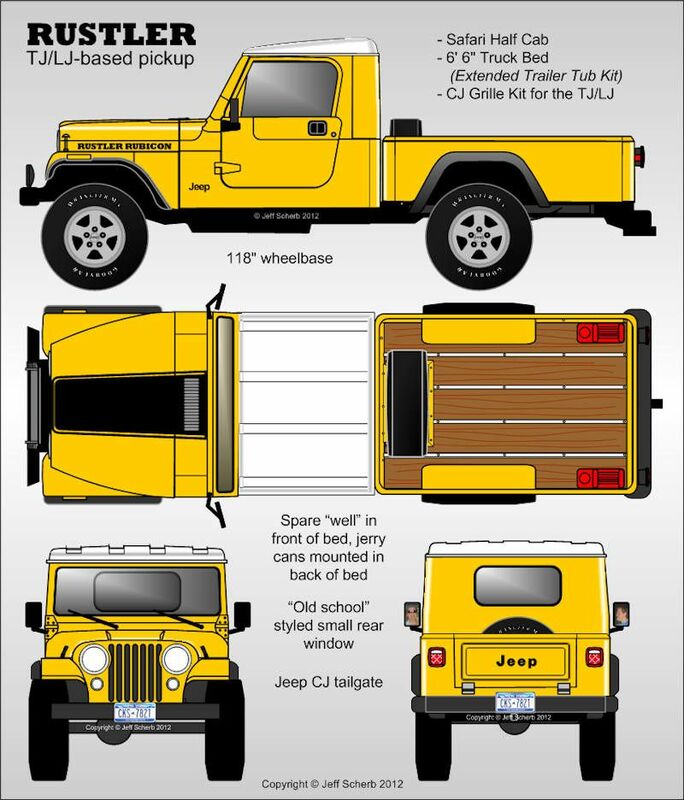 If you get time, would enjoy seeing a sketch of what I'm thinking; TJ tub, Safari half cab, the CJ2 fender/grill setup, 5' bed with round tube rack that places a roof top tent an inch or two above the roof line. Thanks! Here you go. I've drawn it with the minimum wheelbase necessary, which is about 113". 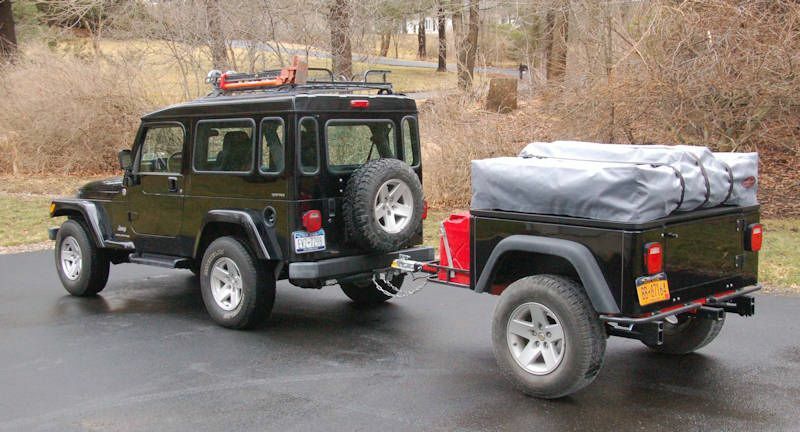 (a standard Wrangler has a 93" WB, a Wrangler Unimited 103"). 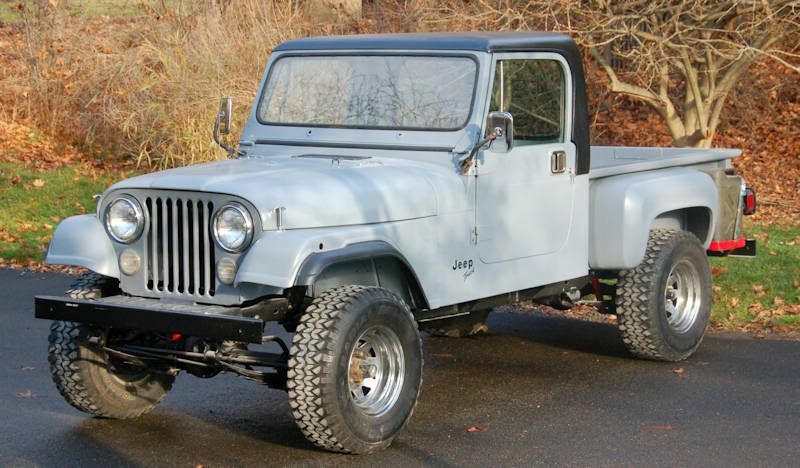 Also I assume you meant the "CJ Grille Kit", a kit to install a CJ-2 grille/fenders on a TJ doesn't exist, but the CJ Grille Kit (CJ-5/CJ-7/CJ-8 grille) does exist. The tent all the way above the roof seems a bit high, but I've drawn it as you asked. 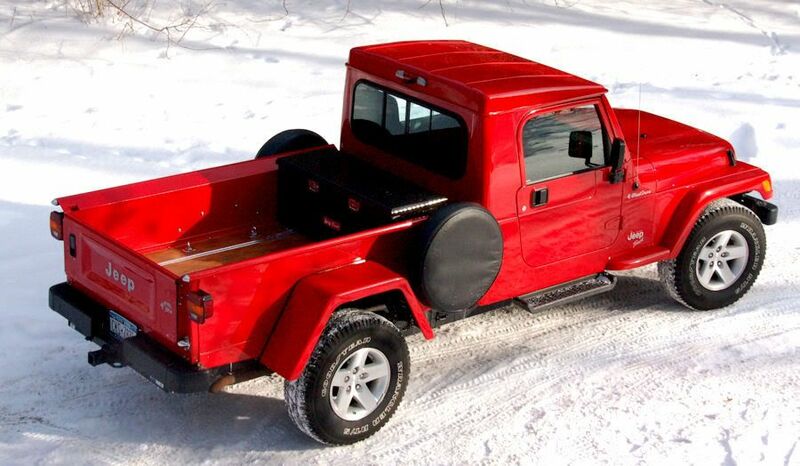 The Safari Half Cab is about 4" taller than a standard halfcab, for example a Gr8Tops half cab. They're not Chevy fenders, Chevy fenders would be much too large for a little Jeep. 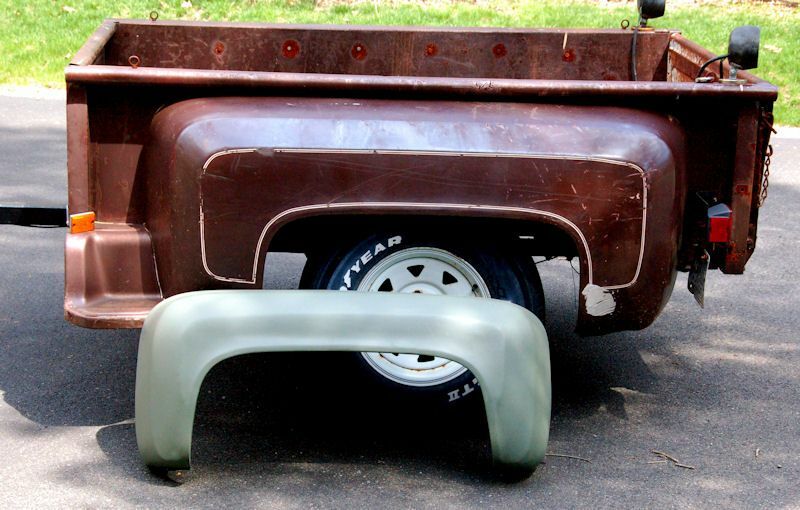 I did them custom just for the Gaucho project, here's a photo of a Gaucho fender in the foreground, and Chevy fender behind it. Cool, that was fast. Didn't you do some CJ2 style flat fenders? On the rack, thinking about just the ladder bump portion being above the roof, not the whole tent. On WB, maybe 118-120" so the axle is more centered on the tub. Thanks! Also Deborah will be happy that it is yellow. (08-25-2014, 04:16 PM) Scott Wrote: Cool, that was fast. Didn't you do some CJ2 style flat fenders? On the rack, thinking about just the ladder bump portion being above the roof, not the whole tent. On WB, maybe 118-120" so the axle is more centered on the tub. Thanks! Also Deborah will be happy that it is yellow. 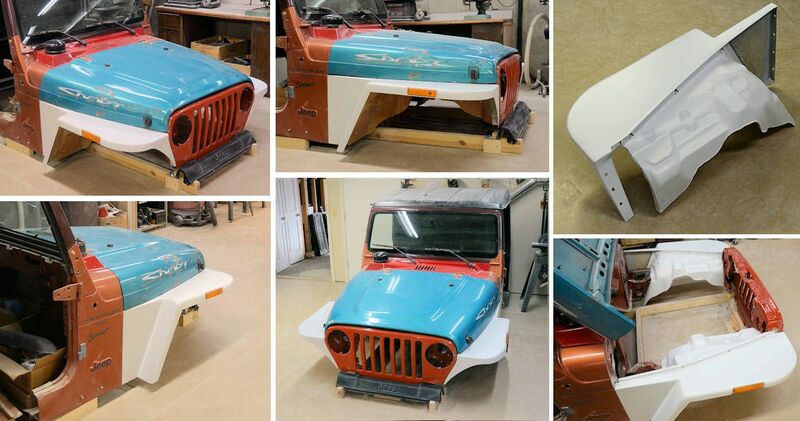 Yes I did CJ2-style flat fenders, but they are designed to work with the stock TJ grille. 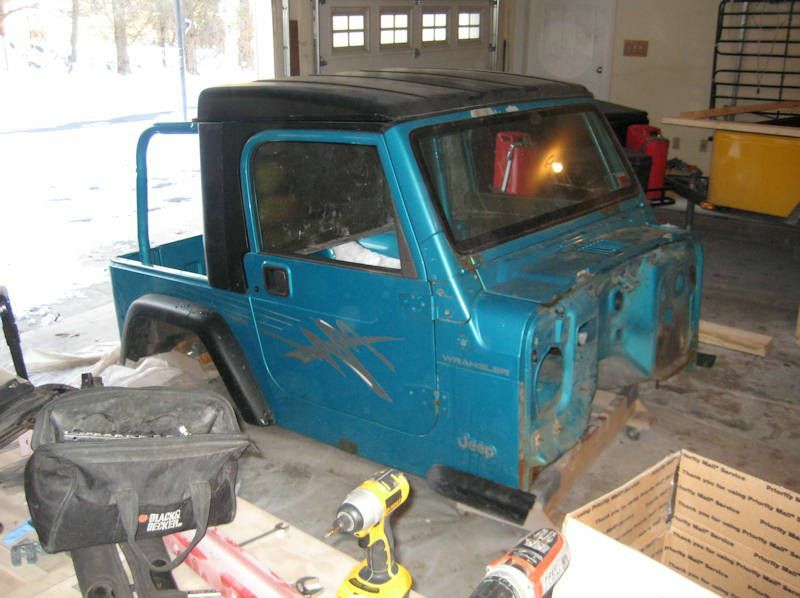 Would you like me to redraw it with a TJ grille and the CJ2 fenders? I will lengthen the wheelbase and lower the tent. 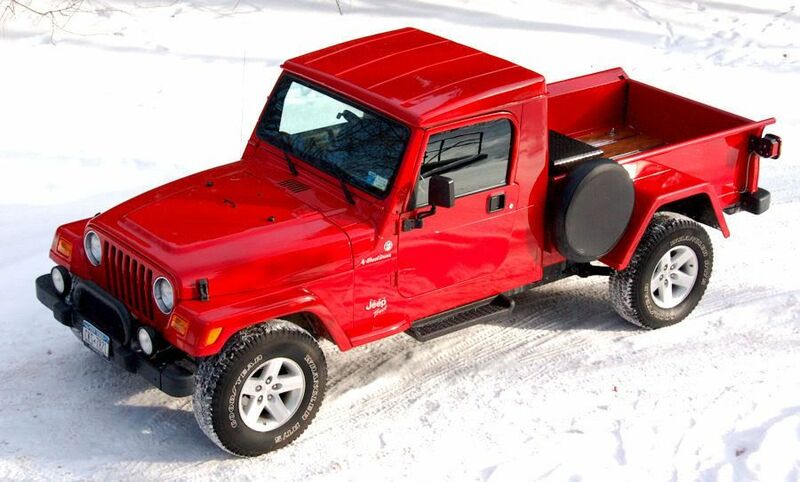 Ok, now I remember; Flat fenders on a TJ front end it is. 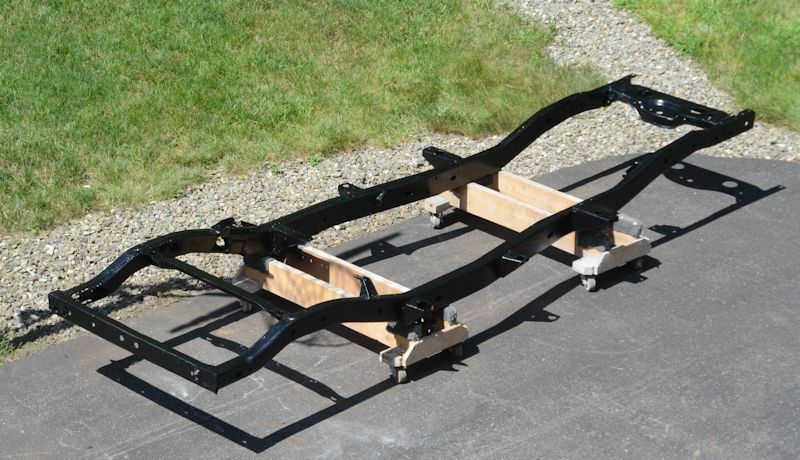 (08-25-2014, 04:26 PM) Scott Wrote: Ok, now I remember; Flat fenders on a TJ front end it is. Here are some of the parts I've got on hand for the project. The Dinoot kits come in two lengths - 53" and 6'6", so several different pickup lengths could be possible using unmodified Dinoot parts. The Dinoot parts are also easily modified to whatever length is desired. The kit above is the 6'6" Dinoot Extended. It'll be fun to mix and match the various parts to see what we can come up with .